Fassinating Fassbender - A Michael Fassbender Fan Blog: Assassin's Creed Tickets on Sale NOW! 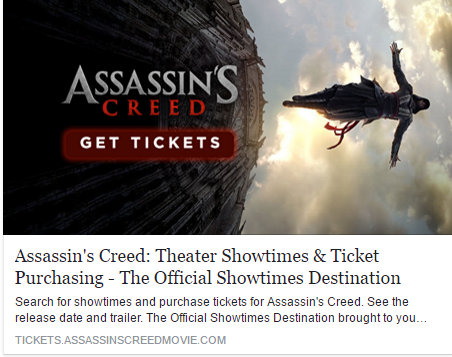 Assassin's Creed Tickets on Sale NOW! The moment we've all been waiting for this year, Assassin's Creed is almost here and tickets are available for purchase in many cities! I got my ticket for the December 21st 7pm show at AMC Century City. I was so early in jumping on buying my ticket this morning that only six other people were ahead of me and they bought tickets in the first row. I'm dead center in the back; a perfect strategic location to watch the entire screen and Michael in all his assassin glory! Especially if you live in an area where theaters reserve seats (I have mixed feelings about this, but in this case, I like reserved seating), you need to get your ticket asap! Additionally, as I posted on my Instagram yesterday, in select theaters, there will be a Virtual Reality experience with Assassin's Creed! Take a look here!